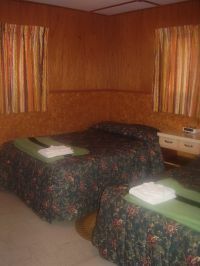 We offer 10 spacious and immaculate cabins. 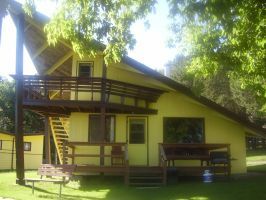 Your cabin overlooks and is close to the lake. You'll find everything you need, as your cabin comes fully equipped with coffee makers, toasters and ample cookware, dishes, cutlery and a propane BBQ grill to please the most demanding chef. We can sleep you and up to 9 of your friends in their own beds in the same cabin. The other cabins sleep from 2 to 6 people comfortably. All fresh linens, pillows, towels and cozy Hudson Bay Blankets are furnished. 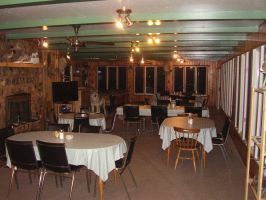 Meals are served in our spacious dining room, by our friendly staff overlooking the lake. Breakfast is served in our dining room between 7:00-8:00AM. Dinner is served at 6:30PM. We take pride in serving you with the finest meals, the heatiest of appetites will be satisfied. We are famous for 10oz New York Strips and 2'' thick pork chops. All meals include non-alcoholic beverages, salad, homemade bread and desert. Our housekeeping guests are also invited to enjoy dining with us in casual comfort. Our guests keep coming back! The number of guests who continue to return year after year is a real compliment to our commitment to friendly service. You will find first class facilities, equipment, fishing, and awesome hospitality. For your use, we offer 16' and 18' Lund boats powered by 25 and 40hp Mercury/Yamaha motors with electric start. At the dock you will be greeted by our friendly staff who are there to ensure a successful vacation to remember for a lifetime. Your boat is waiting prepared with gas, bait and other items to start your day. At the end of your day, our staff is there to help dock and unload your boat, fillet, package and freeze your catch. Fuel service is conveniently located at the dock. Guides are available by pre-arrangement. You may purchase both live and artificial bait at the Lodge, as well as fishing and hunting licenses. When you arrive we will give you a free map of Eagle lake and mark the HOT spots for you. 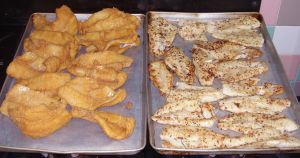 Need a fish filleting lesson? We will be more than happy to help you out. When available, we supply free ice to cool your favorite drink. 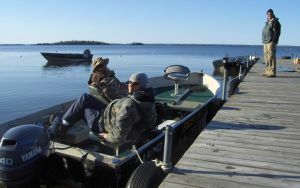 Paddles, dip nests, life jackets, minnow buckets and swivel boat seats are all provided. 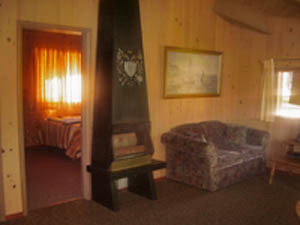 Pay phone, satellite TV, pool table and screened in deck are located in the main Lodge. Come on over and swap a few stories, see where others are catching fish. Coffee is always on. Guests can also find at their disposal a sand beach, swim raft, tube, knee board, paddle boat, canoe, horseshoes, basketball net, fish cleaning house, freezer fish wrap, battery charging and shore lunch equipment. Children's playground and boat launching nearby. If you want to take a break from the lake, Dryden and Vermillion Bay are close by and you can play a round of golf or got to the rec center, museum or gift shops. Banking and medical facilities are there as well.